These earrings may not be the traditional Fibonacci-based crochet pineapples, but looking at the finished project made me crave fruit. They’re a quick and fun project you can do in many “flavors” of yarn and beads. The number of beads give the earrings some weight, but they’re still quite light and easy to wear. Finish off. Add ear wire. This entry was posted on Thursday, July 16th, 2015 at 12:00 AM by Candace	and is filed under Free Crochet Patterns. You can follow any responses to this entry through the RSS 2.0 feed. You can skip to the end and leave a response. Pinging is currently not allowed. 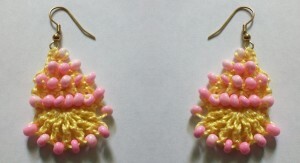 Do you thread the beads onto the thread before making the earrings? Rachel love this pattern. I know who is getting these for Christmas.